200% up to $1,000 Deposit Bonus. 200% up to $1,000 Deposit Bonus at one of the best online poker sites! give you a 200% Deposit Bonus up to $1,000! Player Point demands (FPPs). You need to collect 83.335 FPP for every $5 increment. Please NOTE: Minimum deposit required is $20. via the Cashier tab. All bonus funds are listed under the Pending Bonus section of your account. bonus per deposit. Multiple pending bonuses will be earned in the order that they were created. 1. 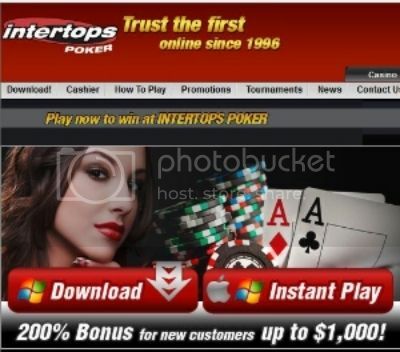 Open up the Intertops poker client, log in and click on 'Cashier'. 2. Choose your deposit option - if you need assistance, please use 'Live Help'. button. The bonus is immediately available on your account and can be viewed under 'My Account' - 'Bonus Details'. code expires 90 days after usage whether or not the full bonus has been cleared. PLAYERS WHO WANT RAKEBACK PLEASE USE THIS BANNER TO OPEN AN ACCOUNT WITH!